While both participate in a production of Death of a Salesman, a teacher's wife gets assaulted in her new home, which leaves him determined to find the perpetrator over his wife's traumatized objections. 2016’s Oscar-winner for Best Foreign Language film, The Salesman takes us to Iran. Married couple Rana (Taraneh Alidoosti) and Emad (Shahab Hosseini) live in an apartment complex with serious structural problems, and these force them to move to a new abode. It turns out this residence’s former resident used it as a base for her work as a prostitute, and this past haunts Rana and Emad. One of the woman’s clients comes by and finds Rana alone. He assaults her, and this sends our lead couple down a difficult path as a result of this brutal incident. Between the announcement of the 2017 Oscar nominees on January 24 and the end of voting on February 21, something significant occurred: President Trump attempted to put a “travel ban” on certain countries into effect. If this edict stayed in place, it would’ve severely curtailed the ability for the residents of seven countries to enter the US – including Iran. Courts rapidly blocked this so-called “Muslim ban”, but it still brought out ramifications, some of which connected to Salesman. As a protest, writer/director Asghar Farhadi refused to attend the Oscars. This clearly gave Salesman more publicity than otherwise would’ve been the case. The big question becomes whether or not this controversy helped the movie earn its Oscar. My gut says yes, as Oscar voters obviously aren’t impervious to factors that don’t strictly relate to the quality of the project up for award consideration. Leave the “Muslim ban” out of the equation and I think it’s less likely Salesman wins the Oscar. Does this mean the movie didn’t deserve the prize? No – whatever extracurricular issues may have impacted its success, Salesman offers a thoughtful and well-rendered tale. At its heart, one could view Salesman as a “revenge thriller”, for most of the story concentrates on Emad’s attempts to find and deal with the man who assaulted Rana. This doesn’t exactly lead to pulse-pounding action, though, as the film takes a more realistic approach to the subject. That means Emad greets more of a complex reaction to his investigation, and when he finally finds the man responsible, the movie lacks the typical conclusion. I’ll avoid spoilers but will say that the movie’s “villain” may be one of the least intimidating – and saddest – “bad guys” in history. Which seems to be the story’s “shades of gray” point: real-life doesn’t offer clear-cut good/bad like the movies. It also comes with “heroes” who can be ineffectual, which is Emad’s status through much of the movie. The film’s characters star in a stage production of Death of a Salesman, and that’s why Farhadi chose to call the movie Salesman. The choice of Arthur Miller’s classic play doesn’t come as a coincidence, of course, as Farhadi uses the flawed Willy Loman character as an analogy for Emad and the “villain” as well. Happily, Farhadi doesn’t beat us over the head with these connections. They lay the groundwork for our understanding of the characters but don’t dominate, so viewers unfamiliar with Death won’t feel left out. Farhadi also manages a little understand cultural commentary, especially related to censorship concerns in Iran. The stage production of Death suffers compromises due to legal areas, and some of these result in ridiculous moments such as one in which we’re told a female character is nearly naked – but we see a woman with barely an inch of skin on display. Like everything else, Farhadi handles these moments with subtlety. He imbues the movie with a sense of this reality but doesn’t force ham-handed commentary down our throats. Really, it’s Farhadi’s refusal to follow cheap movie conventions or to take the easy way out that makes Salesman successful. It treats a well-worn subject with depth and nuance, factors that make it an involving character piece. The Salesman appears in an aspect ratio of approximately 1.85:1 on this Blu-ray Disc. The movie offered a terrific transfer. Sharpness always satisfied, as the film seemed consistently crisp and well-defined. If any softness materialized, it escaped me, as I thought this became a tight presentation. No issues with shimmering or jaggies occurred, and I saw no edge haloes or print flaws. The palette tended toward the cooler side, but exceptions occurred, and those added vivacity to the image. In particular, the image exhibited rich, vibrant reds that helped make the hues impactful. Blacks looked deep and dense, while low-light shots provided nice clarity. Across the board, I felt pleased with this top-notch image. Though not as impressive, the movie’s DTS-HD MA 5.1 soundtrack worked well for the film. Given the story’s quiet character orientation, much of the mix remained subdued, but a few sequences contributed more breadth. For instance, a rainstorm used the five channels in an involving manner, and street scenes also provided a strong sense of place. These didn’t dazzle but they gave the mix nice oomph at times. Audio also satisfied. Speech remained natural and distinctive, without edginess or other concerns. Effects appeared accurate and full-blooded. The mix lacked any score. For a subdued character piece, this was a more than acceptable soundtrack. A Conversation with Writer/Director Asghar Farhadi runs 15 minutes, 30 seconds. In this chat, Farhadi discusses the project’s origins and development, story/characters, connections to Death of a Salesman, cast and performances. Farhadi makes this an introspective and informative piece. 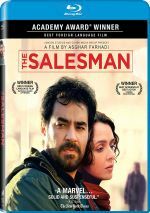 Nominally a “revenge thriller”, The Salesman lacks any of the action or violence that mark the genre, and that ends up as a positive. An introspective and involving character piece, the film offers an unusual and rich exploration of the subject matter. The Blu-ray brings us very good picture and audio but lacks a lot of supplements. Salesman delivers an effective drama.